Scarlet Monastery, originally a set of four separate spaces introduced into World of Warcraft in 2004, was a dungeon painted in vivid narrative brushstrokes. It was a commitment, an ordeal even, but also it was a campy, horror tale full of pop culture references. It spoke of Hammer horror, of Sleepy Hollow, of The Exorcist and Raiders of the Lost Ark. It is, to this day, a fond memory for many a nostalgic World of Warcraft player, because we all remember Scarlet Monastery. For WoW players, Scarlet Monastery became a rite of passage. Similar to its plotline of zealots deep in devotion to their cause, Scarlet Monastery required you to commit to it. If you were from the Alliance you would have to travel through countless map zones to arrive at the monastery, including travelling quite close to the Horde-controlled Undercity. It took hours. Because many players would originally attempt the dungeons at a low level and couldn’t yet ride a horse, the journey to Scarlet Monastery also had to be undertaken on foot. Whilst workarounds were eventually invented to cut the walk down, this epic march (or should I say pilgrimage) was part of what made Scarlet Monastery so memorable. And of course, no Alliance trip to Scarlet Monastery was complete without a lighthearted Undercity raid after the dungeon was cleared. The dungeon was a series of seemingly endless corridors lined with stained glass, a monastic setpiece that featured nearly every reference in the Gothic horror rulebook. Militant zealots blindly fighting in the halls? Check. Powermad priests in the library? Check. A gladiator-style miniboss that one could only access if they had a mythical key? You betcha. It even included a haunted sword that actually talked. 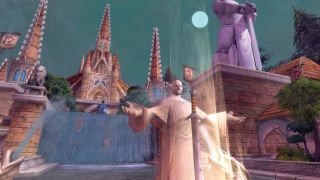 The quests for Scarlet Monastery required players to ‘cleanse’ the monastery of the rabid cult members, playing directly into the ways in which the Alliance players had already interacted with religion. The Church of Holy Light, based out of the Alliance stronghold Stormwind, holds the virtues of respect, tenacity and compassion in the highest regard. Similar to other fantasy churches featured within gaming, such as the Church of Eternal Fire in the Witcher franchise, or even the Chantry in Dragon Age, the church within Warcraft has priests, bishops and archbishops, cathedrals, abbeys, relics and reliquaries. All iconic signifiers of a particular type of organised religion – one of structure, hierarchy and the purity of devotion. The act of resurrection, performed within the original dungeon, as part of a dynamic final boss fight, is perfectly suited to fulfil this stylistic choice. As players continually interacting with fail states, or the ‘You’ve Died’ title screens of the gaming landscape, we often forget how impactful a resurrection is narratively. The resurrection of the initial boss Durand by High Inquisitor Whitemane was a shocking part of the battle. Additionally, her ability to resurrect any other dead enemies within 100 yards was particularly frustrating. Rather than a hero’s redeeming return to life, this corrupted resurrection referenced the ‘they’re back’ reveals present within horror film franchises—the final jump scare reveal that the film isn’t over and the hero isn’t actually safe yet. Religion is often used within games to enrich narrative, allowing for greater immersion—it makes virtual worlds seem real. It can also be used in a purely aesthetic way—there are easily identifiable tropes and motifs that speak of the religious within media. One of these is the way in which games reference the Christian Last Supper imagery—promotional materials featuring game cast members in portraits designed to remind viewers of Leonardo Di Vinci’s famous painting. While Far Cry 5’s use of Da Vinci is still recent, it has also been seen in Dragon Age: Inquisition. This overt referencing can be seen throughout Scarlet Monastery’s entire quest design. Here, religion is used not only as an antagonist, in the form of the zealous Scarlet Crusade, but also as the protagonist’s motivation. All of this—the campy references, the Gothic overtones as well as the inherent drama—was why I loved Scarlet Monastery. How could you not love something that required from you a full evening’s work and paid you back with such dramatic, pulp fiction goodness? It wasn’t grinding, or a forgettable dungeon that you only did for an achievement. For me it was the best of what World of Warcraft could offer—a compelling narrative that was built on relatable tropes, full of references so incredibly cinematic that you instantly understood them.